This week’s Rate the Dress turns from bold primary hues on black, to soft pastels overlaid with sheer black organza, and from sleek ’20s, to frothy Edwardian. I was intrigued by the number of commenters who felt that some 20s dresses ‘wear heavy’, and that this was one of them. A full point lower than the week before! We’re slipping! This dress (despite its weird pin-head) has been on my Rate the Dress list for some time, and this week seemed like the perfect time to showcase it. European dressmakers seem to get all the glory when it comes to Victorian & Edwardian fashion – but they did have rivals. The late 19th century saw the rise of a number of extremely talented American dressmakers, including Mrs C Donovan. Unlike their European counterparts, notable American dress designers were predominantly female. While they never achieved the cachet of Worth & Pingat, the top levels of American design houses made creations for wealthy Americans who also patronised the European houses. Some of their creations show workmanship and design details that easily match the more famous European houses. 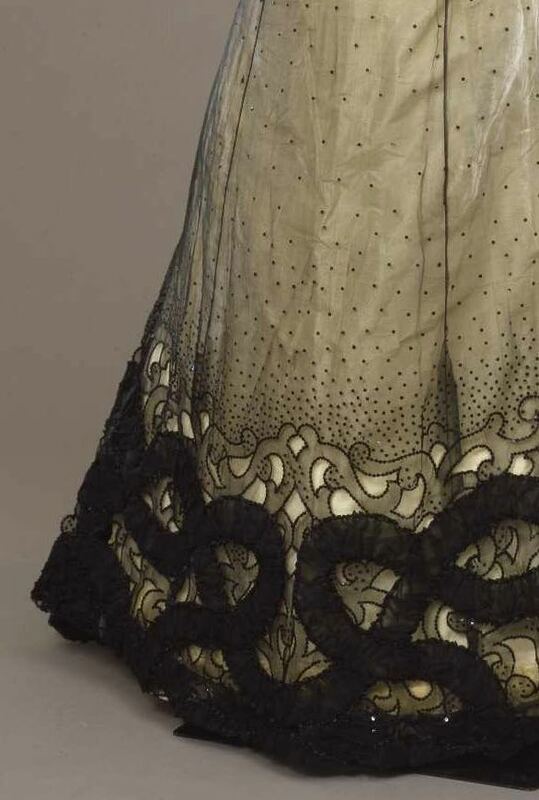 Whether Mrs C Dovovan achieved that level is for you to decide, but certainly this dress, with its scrollwork cut-outs at hem and bodice, shows an astonishing level of detail and workmanship. The colours, choice of flowers, and slightly thicker waistline suggest this dress was worn by a more mature woman, rather than a debutant. Can you see a society hostess reigning over her soiree in this? I truly wish that this had been displayed on a different mannequin; I am having a difficult time discerning what the bodice really looks like. Is that bit at the top white tulle or silk? I do love the shape of the sleeves, the skirt and the embellishments on the skirt. I want to love it, but it is confusing so I give it a 6 out of 10. I adore it. As a mature woman with a thickened waistline I would love to wear it. The lace is feminine without being overly sweet. The black dots get more intense toward the bottom edge which is a nice touch. The sleeves are perfect for those of us with mature arms. I give it a 10. I see whaat you mean about the mannequin. As for the dress, the silhouette is classic for the early 1900’s. I have no problem with the color of the dress itself, or the underlying sheath. I am very partial to the cutouts, embellished with artfully placed sequins. 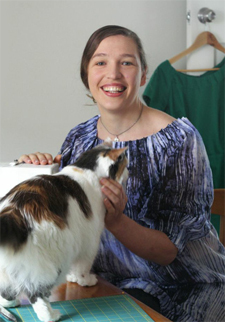 The dress appears carefully constructed and in very good condition. I like the sleeves, they add a nice fluffy feminine touch. On the other hand, the offending parts really annoyed me. The flowery apparatus on the left shoulder was entirely out of place. It had too many colors, it was too high and wide. I’m guessing that the designer was trying to make the dress a touch more frivolous or youthful. It just doesn’t work. Something like a silver or jet arrangement of flowers would have been enough. Likewise, the ruching which covers most of the nice cut-outs was unnecessary. My score: 6.5 out of 10. It is very…clever, and the workmanship is skilled. What it isn’t is beautiful. The thick, heavy black velvet trim looks clunky, and the (necessary) seams on the black tulle overlay on the skirt interrupt the flow of the design. Yet the cutout work (what I can see of it under the gargantuan velvet squiggles, that is) is beautiful, and engagingly different, and the spray of sequins on the skirt probably was stunning under period evening lighting. 5.5 out of 10. Without the velvet, it could have been so much higher! For some reason the black trim looked like velvet to me. It isn’t, but it’s the width and blackness, not the type of fabric used, that make that trim strike such a false note in the design. This may sound odd, but I find I usually like the Edwardian silhouette more than I like actual Edwardian dresses. There’s a major reason and a minor reason for this. The minor reason is I almost always dislike big puffy sleeves such as Edwardian evening gowns as this typically feature. The major reason is the trimming of this era. Namely there’s too much of it. 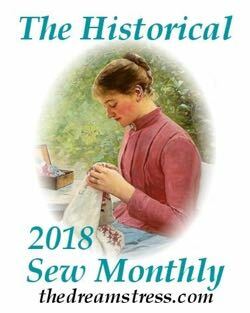 I feel like a huge hypocrite saying this because my favorite period is 1876-82, a time period well known for its austerity and restraint when it came to fringe, frills and ruffles(lol). 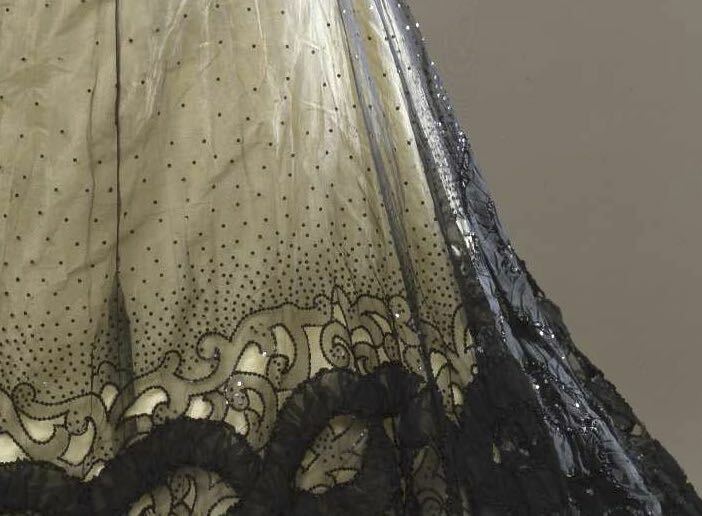 But I feel like Edwardian dresses, even some of the lovelier examples, will use 4 different kinds of lace on one dress then add some metallic trim, or they will layer lace and embroidery on top of one another spoiling the effect just one would give. Even when the dress gives a beautiful first impression, I look closer and see the layered on trims and it irritates me. 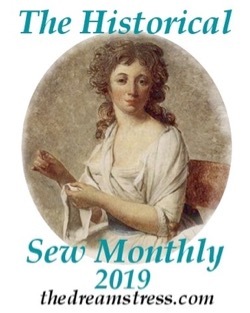 The best Natural Form gowns will stick to 1-2 kinds of trim, and even though there will be an excessive amount of drapery and ruffles they will harmonize, and not just look like they were piled on by self indulgent dressmakers who couldn’t resist adding more. So this dress seems like a good example. They have this lovely, decadent cutwork embroidery with sequins(I’m guessing that’s what this is). Any sane person would think, this trim all by itself is a showstopper, it is obviously meant to be the star of the dress it adorns. But these Edwardians, what did they do? They slapped ruched black organdy on top of it! 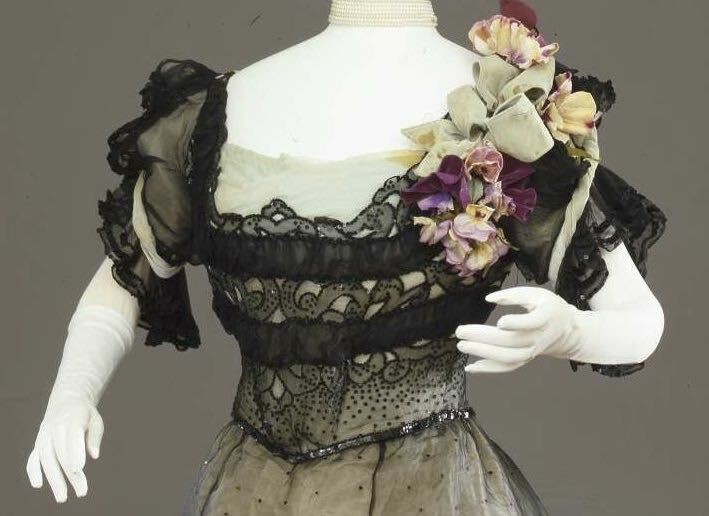 Now I actually like the design of the black organdy ruches on the skirt, it’s kind of Art Nouveau. But why would they put it on top of the awesome cutwork embroidery? The ruches make it hard to see the delicate cutwork, and the delicate cutwork makes the ruches look heavy and almost clunky by comparison. It’s not quite as offensive on the bodice, where the ruches are just straight bands. But still, between that and the big a** bow and flowers on the shoulder, I can’t hardly see that fabulous cutwork. Even though I still like the silhouette, I have to give this a 5 because it annoys me so much. It would be lower but I’m taking pity on it because after all, this was the fashion at the time. So most evening gowns of the era have this sort of issue. Sorry but it’s a big no from me. I think the design and fabric don’t quite go together. The black fabric looks cheap and the underlining looks dull and unremarkable. It could have been so much more delicious. The ideas are there but it misses the mark. I don’t know what sort of soirée this was worn at but I bet they served boring food and had boring conversations. Usually I like the Edwardian period and I like limiting clothing to one or two colours (and I’m fond of black and white). But I really don’t like this one. I think it’s really rather tacky. I think it’s because the decorative parts are almost all so large and out of proportion. (The cutwork’s not too bad but the black stuff looks like tinsel in mourning and the flowers are just out of place and odd.) Possibly the see through effect with the seams showing through doesn’t help either. In the end, I can’t actually find anything to like about it. Wow! I don’t often leave my rating as there are so many more educated comments, but now I feel I have to save this poor dress. I really like the overall effect of the dress, its silhouette, its restrained but pleasing colour scheme (I love how the cream underdress lightens up all that black). The dots and sequins on the organza (tulle?) layer add interest, and unlike other commenters, I think the seam lines, with their vertical emphasis, help make it more elegant. The ruffled sleeves are nice, and very period. The bouquet… Well, I like the colours, they add some life to the outfit. They are a bit much for my taste, but again, typical for the period I guess. My only qualm is with the doubled patterns. I stared long and hard at the bottom trim, wondering whether the black scrolls overwhelm the delicate cut outs below. It’s definitely unusual, but on balance, I think it’s an interesting and surprisingly modern approach to pattern mixing. The two patterns are clearly related, but vary in scale and execution. The black folded lines on the bodice, however, have no such relation, and I hate them. Clunky, out of place, distracting from the elegant lines of the dress. Overall, an interesting ensemble for a hostess that manages to balance mature elegance and simpler lines with the over the top romance and trim of the era – plus some weird blocky lines. Please do comment more! <3 What I really love about Rate the Dress is that it is a conversation from all sorts of angles and experiences about the dresses. I often learn far more from the less 'experienced' comments, because you're seeing things with fresh eyes! I’m in the minority too. I think the gown is luscious! Especially for a winter evening out, perhaps to the theater, with a thick fur trimmed velvet cape. I like the way the trim at the bottom gives weight and substance to the gown. The embellishment on the left shoulder is like a corsage and a little bit of color for a dreary winter evening. The proportions of the mannequin are off and give the gown a skewed look, but I can see past that and think the gown is absolutely lovely. I’d like to see it with black gloves too. This is the first Rate-the-Dress in a long time that gave me an immediate averse reaction. I actively dislike the colors and the combination of decoration styles. I do basically like the silhouette, and I can applaud the workmanship and design of the cutwork. It’s strange – ;the cutwork is one element, and so would seem to be out of place, yet for me it’s everything else that’s out of place! I am fine with the corsage effect, but what are the twisted cream bands are on the sleeves?anyone know? I am not fond of the larger ruched band covering up the lovely cut work. 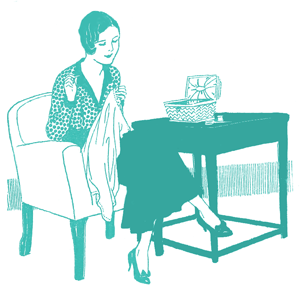 I am trying to think what purpose it fills except to weigh down the lace net. and if that is the case, I wonder if the wearer got her own dressmaker to add it, and the bands across the front to hopefully blend in. Maybe she had issues with the net getting in and out of carriages or something. Another question – is the back similar to the front? or is there not an image of the back of the dress. It would be interesting to see whether there is any of the excess ruching in the back. I like the sheer silk overlay with its cutouts and graduated sequins catching and turning the light. I do not like the ruching over it at the bodice and hem. 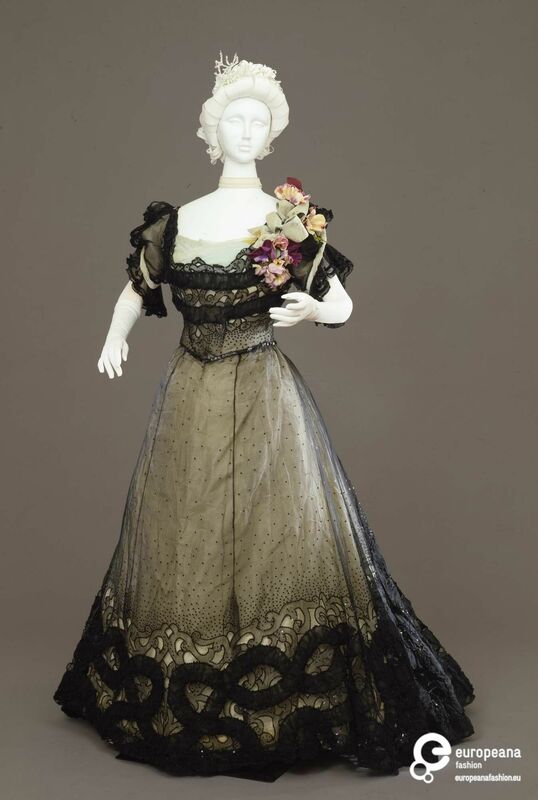 I do not like the floral mess on the shoulder, and the mannequin is missing something at head-level. The skill in creating the sheer beaded and cutout fabric is impressive but the overall impact? Bleah! I like this dress, but I agree there are some odd details that do make you wonder whether another person tried to “make it over” after the fact. The vertical strips of black across the bodice are awkward, and hide the pretty fabric. The flowers on the shoulder would be the next thing to go, and then the sleeve bandages. Not sure what to do with the modesty panel, if it was a less green shade of cream I wouldn’t mind it – could age have tinted it? I actually like the weight that the bottom trim gives to the outfit, despite the tragedy of the hidden fabric. I wish there was a back view – it seems almost like the gauze on the backside is darker, flowing from the waist. All in all, nice bones: unique without being sensational. There isn’t anything I can add that hasn’t been pointed out, but I want to explain my rating, so: I love trumpet skirts, and the silhouette is gorgeous; the way the dots are applied to the skirt and amongst the cutwork is masterful; and I can dig the black organdy trim around the bottom of the skirt because it feels kind of Art Nouveau; however, I hate the two lines of black organdy across the bodice so much it knocks the whole dress down a couple of pegs. Love the dress, the cutouts and the dots. It’s great Edwardian styling. Hate the heavy squiggles on the skirt and banding on the bodice, that are inexplicably covering up the lovely delicate scroll-work and look like an amateur’s afterthought. I hate the way it sags around the too-small mannequin. It’s like a frothy mermaid is trying to arise from the foam but she’s getting dragged back under by a giant squid. Flotsam, Jetsam, now they’ve got her, the squid is on a roll. Poor Unfortunate Soul. Previous PostCan you swim in a worsted wool Edwardian swimsuit? Let’s find out!